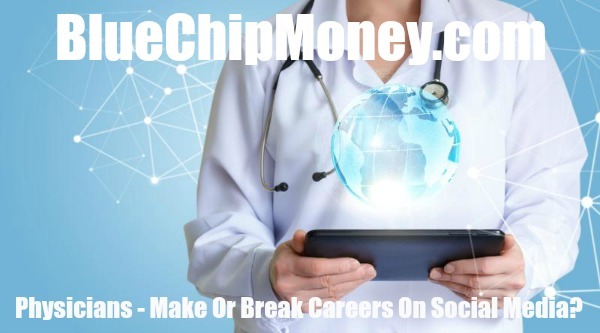 Millennium 7 Publishing Co.: Physicians - Make Or Break Careers On Social Media? Physicians - Make Or Break Careers On Social Media? For doctors in the digital age, your social media fingerprint has the power to either advance or damage your career.. Whether you're using social media to post pictures of your vacation in the Cayman Islands or to reach out to colleagues regarding a challenging patient, the line between personal and professional, as well as what's appropriate, can sometimes become blurred. Research has shown that many physicians using social media report minimal formal training in professional conduct online, as well as a lack of awareness regarding which guidelines to follow. A number of recent studies have highlighted the level of unprofessional social media content posted by physicians. These included profanity, references to (or appearing to be) intoxicated, and sexually suggestive photographs. They also included possible HIPAA violations, which have the potential to damage careers. While this behavior has been observed across all career stages, including attending physicians, the levels were highest among residents and recently graduated physicians. It's easy to get caught out when talking about patients online, as an article in The Hospitalist highlighted. Even supposedly innocuous identifying features can "turn a seemingly harmless post on social media into a patient privacy violation." "Any physician who uses social media has to be mindful and conscious about protecting private patient information even on personal accounts," said Toni Brayer, M.D., chief executive officer of Sutter Pacific Medical Foundation in San Francisco, CA. But your online presence and interactions can also be powerful tools, said ophthalmology resident Steven M. Christiansen, M.D., an avid blogger and Twitter user based at the University of Iowa in Iowa City. How can you turn social media to your advantage? And what guidelines can you follow to make the most of professional social media? Matt Dull, M.D. - who is due to start his critical care fellowship at the Spectrum Health Hospital in Grand Rapids, MI - became interested in using social media professionally when he heard a keynote speaker at a national medical conference discuss the fact that patients were looking for providers on social media. "He said that being engaged with your patients on social media will be of increasing importance in the years to come," Dr. Dull explained. As a resident, he said, he doesn't need to engage patients outside the hospital. But, he added, "In the future, I will be looking for ways to reach patients and potential patients through social media." Indeed, an increasing number of patients turn to doctor rating sites such as Rate MD, Yelp, and Vitals when choosing a physician. "We know that [those sites] are increasingly important avenues for patients seeking more information about healthcare providers," said Dr. Brayer. "We've learned that 'stars' matter and we celebrate good reviews internally and respond to any patient complaints directly for our physicians." Related Article: The Social Media Health Care System? As Dr. Christiansen noted, "We have worked too hard in our training to let a few poor ratings keep patients from coming to see us. Social media can help us create and establish an online presence we control." One of the greatest benefits of social media for physicians is the ability to connect with colleagues to improve diagnostic and other medical skills. "I only recently started using social media for professional purposes," said Dr. Dull. He started by joining the International Hernia Collaborative, a large Facebook group for surgeons to discuss complex hernia operations. "From there, I found all of the other professional ways to leverage social media," he said. "I now regularly find interesting journal articles, medical blog posts, and discussions of new therapies through Twitter." Indeed, a survey of 153 Dutch clinicians found that 76 percent of them used Twitter to extend their network of colleagues, while 71 percent used it to update their colleagues about their work. Related Article: #Match4Zara - A Social Media Cell Donor Search? Pathologists, for instance, use social media to share images with colleagues, students, patients, and even the general public, while professional medical organizations such as the American College for Chest Physicians use it to promote their specialty and provide education, which extends to patients. "I use social media to promote health and wellness and as a way of letting people know what is happening in my organization and in the community," said Dr. Brayer. "As a physician I have a strong voice and see myself as an expert with useful information." Twitter is also becoming a hugely effective tool for communicating content live from medical meetings. Dr. Christensen and his colleagues published a study in Ophthalmology in August 2016, comparing Twitter activity during the American Academy of Ophthalmology's 2014 and 2015 meetings. The "tweets" reached 23.7 million Twitter users in 2014, and 24.5 million in 2015. Social media is also a powerful outlet for advocacy, says Dr. Christensen. A 1-minute YouTube video that highlighted his ophthalmology-related discussions with congressional representatives was viewed 1,700 times in the first week of its posting. "I can tell you that my involvement in social media has opened up countless opportunities to network with others both within ophthalmology and many other specialties." -Steven M. Christiansen, M.D. Whether you are going to use social media to connect with your colleagues, reach out to potential patients, or educate the general public, adhering to professional guidelines is key to protecting yourself and turning social media to your own advantages. The American Medical Association (AMA), and most specialty medical societies, have developed ethics policies on the use of social media during the past few years. Do not post any patient-identifiable information anywhere, ever. Set privacy settings on media sites to protect your own information and content, but know that even if you restrict your posts to your own network, the information can leak out. A good rule of thumb is to never post anything that you wouldn't want to see in a peer-reviewed journal. Maintain appropriate boundaries of the patient-physician relationship. Just because you are online doesn't mean that the rules are relaxed. Separate your personal and professional content. Set up a separate Facebook page to promote your practice or talk about professional issues, and leave the personal one for family and friends - not patients. Say something if you see a colleague posting unprofessional content that may violate professional standards. Recognize the potential consequences of your online life, including negatively affecting your reputation among patients and colleagues. Dr. Brayer has first-hand experience of putting these guidelines into practice. An emergency department physician who Dr. Brayer friended on Facebook frequently mentioned patients that she had treated. "Even though no names were used, it bothered me to see those posts," Dr. Brayer said. As the AMA policy suggests, Dr. Brayer told her friend that these posts could violate privacy rules. "I would recommend health professionals should never post anything with stories about patients or conditions, even if they think they are shrouding identity. It's too close of a line to walk and patient privacy is our oath and responsibility," Dr. Brayer said. Start a professional Twitter feed and share things that you are already doing - for example, medical conferences that you attend, clinical research, and important clinical studies in your field. Keep the personal and the professional accounts separate. For instance, have two Twitter handles, two Facebook pages, and two Instagram accounts. Make it clear that you are speaking only on behalf of yourself and are not representing your employer. Don't ever give medical advice in a public forum. Expect criticism from colleagues. Use that to educate them on the value of social media done right. Related Article: Healthcare Organizations Missing The Social Media Boat? "With all of its problems, there is no doubt that social media is here to stay," Dr. Brayer commented. "As healthcare professionals we should use this tool as much as possible to promote health, nutrition, medical-political points of view such as information on the Affordable Care Act, healthcare legislation, and changes in Medicare and Medicaid. I believe the public is hungry for accurate health news they can trust." Guest Authored By Debra Gordon. Debra is an independent healthcare communications consultant specializing in health, medicine, and health policy for consumer, medical, and corporate audiences since September 1999. Her particular specialty is healthcare reform, with in-depth knowledge around the Affordable Care Act; new healthcare delivery models, including Accountable Care Organizations and Patient-Centered Medical Homes; Medicare and Medicaid policy; value-based purchasing; health information technology; quality and cost issues; managed care; and patient empowerment. Debra is one of only a handful of medical writers who can confidently communicate about the juxtaposition of healthcare reform and the clinical side of medicine for a variety of audiences, ranging from consumers to physicians to healthcare organizations, businesses, and vendors. She brings more than 25 years experience in the healthcare field as a newspaper reporter covering health and medicine for two major daily papers; provider relations manager for a mid-sized managed care organization; book editor and author; and, for the last 15 years, an independent medical communications consultant. Follow Debra on Twitter. Related Article: Social Media Tools For Physicians? "With all of its problems, there is no doubt that social media is here to stay," Dr. Brayer commented. "As healthcare professionals we should use this tool as much as possible to promote health, nutrition, medical-political points of view such as information on the Affordable Care Act, healthcare legislation, and changes in Medicare and Medicaid. I believe the public is hungry for accurate health news they can trust.."